Although every day we find more and more general DVD players capable of reading file formats that were exclusive to PCs until not so long ago (such as the renowned DivX video format), to guarantee complete compatibility and be able to create your DVD in a format similar to that of the original DVDs it's necessary to use a DVD authoring program. TMPGEnc DVD Author is a specific software to author DVDs, that also includes recording and editing options. 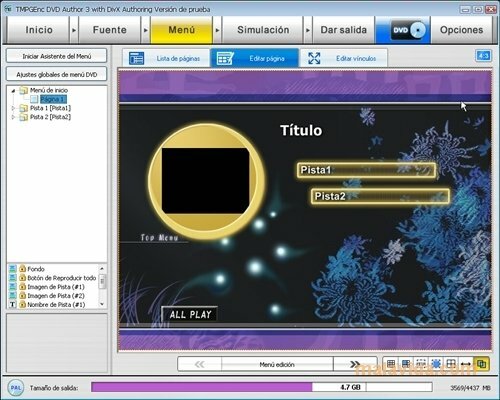 This program generates DVDs that are compatible with the majority of DVD players, creating the VIDEO_TS and AUDIO_TS folders, the IFO, BUP and VOB files, the video selection menus, the chapters, etc. Capture DV and HDV. Possibility to capture video from the video camera connected to the IEEE 1394 port. DivX Ultra Authoring. It allows us to generate DVDs with menus and browsing capacity, but with the advantages of video compressed in DivX. Support for High Definition DivX. Multiple subtitle streams. Includes the possibility to create multilanguage DVD or DivX projects. Optimized encoding, that increases the process speed compared to earlier versions. Capacity to add more kinds of file sources to the DVD and DivX projects, among which you'll find: DVD-Video, DVD-VR, MPEG 1/2, AVI, Windows Media, DivX® and QuickTime (mov, qt, mp4, m4a, 3gp, 3g2). It's a trial version that can be used for 14 days.